First off, I must say that I've made some really delicious things over the last few weeks, but these are fighting the chocolate shortbread for first place honours. Sweet, but not overly so, these are definitely interesting bars. 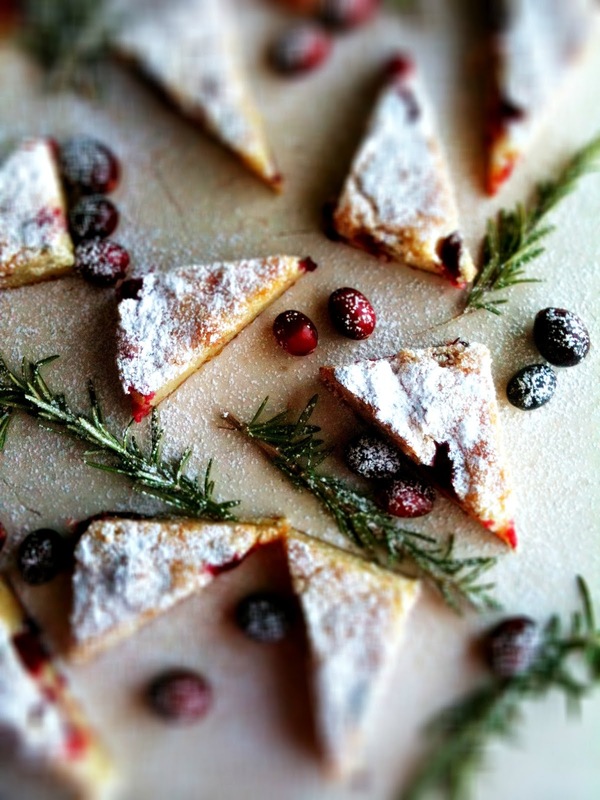 Rosemary adds a delicate herbal punch, that plays really well with the pops of tart, fresh cranberry, all swaddled together in a deliciously dense blondie. These bars don't shout WHITE CHOCOLATE so even if you are a hater, I think you might love these. And people. The smell from your kitchen will be insane. Rosemary has that way of smelling woodsy, yet palatable. I dig it. 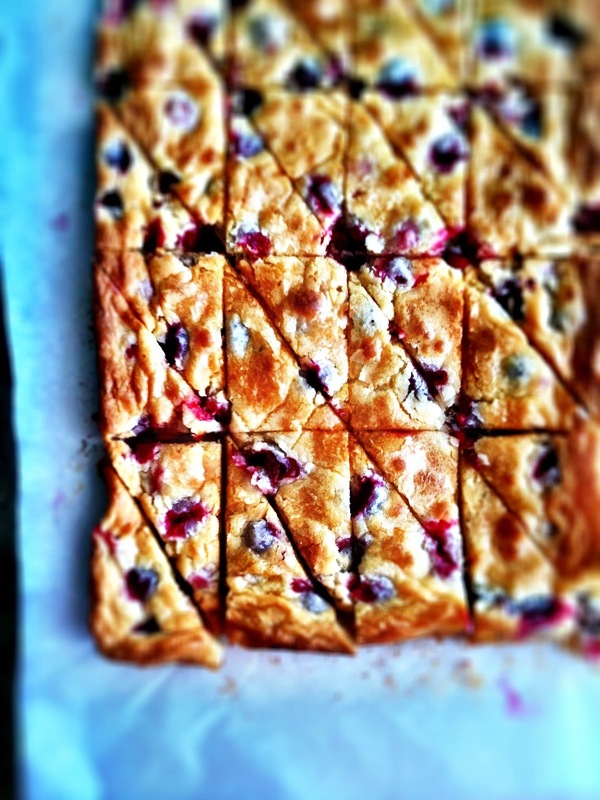 I knew from the beginning I wanted to use fresh cranberries as opposed to dried in these blondies, mostly because I'm not a fan of dried cranberries, except maybe on salad. I love adding herbs to baking, and I knew rosemary would be seasonal and delicious when partnered with the rest of the ingredients. These came together quite quickly in a smooth batter and all you need is a dusting of icing sugar to make them presentable. I should note that the amount of chocolate is estimated...I just used up what I had kicking around in my pantry, and if Santa doesn't bring me a kitchen scale I'll have to go seek one out in the New Year. So I broke cardinal rule of baking: thou shall use exact measurements otherwise your baking will be crap. Um, no. I educated a guess on the amount of chocolate and these turned out amazing. It's only baking, not brain surgery. On that note, I'll leave you to it; hoping you find some merry amidst the mayhem. Preheat oven to 350*F. Line the bottom and sides of a 9x13 pan with parchment paper, leaving a slight overhang. Butter the parchment. In a medium saucepan over low heat, melt the chocolate and butter together, stirring constantly until smooth. Remove from heat and stir in the rosemary and sugar. Pour this mixture in the bowl of a mixer and beat in the eggs and vanilla until smooth. Add the flour, baking powder and salt and beat until just incorporated and no dry bits of flour remain. 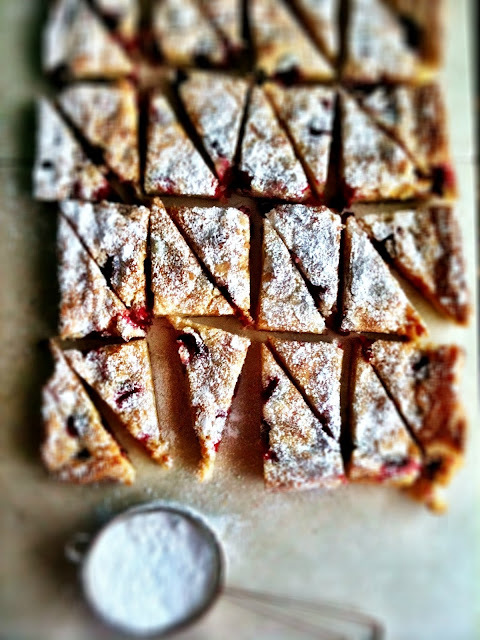 Fold in the cranberries and pour into prepared pan. Bake for 25-30 minutes, until top is lightly golden and toothpick inserted comes out clean. Cool completely before cutting. Dust with icing sugar before serving. These freeze well, for up to 3 months, and keep in the fridge for up to 3 days. Makes about 24 blondies. Great post Renee, and wow these look good. Rosemary must make them so delicious! Great to see you wonderful baking and photography again. 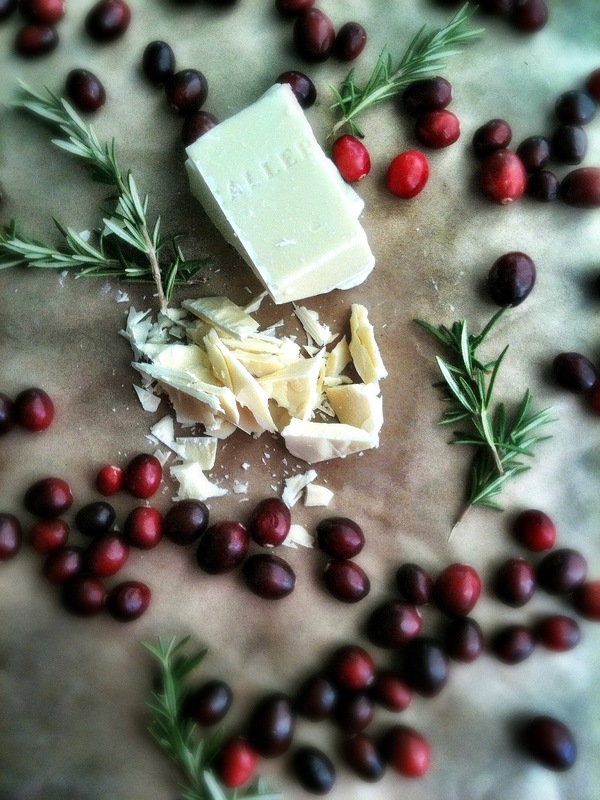 White chocolate is fav of mine and the combining with rosemary sounds interesting. Thanks Donna - do it! Julie, thank you - they interesting (and delicious!) bars indeed. BEAUTIFUL! The word that came to mind when I saw these! My mouth is watering looking at these blondies, Renee! 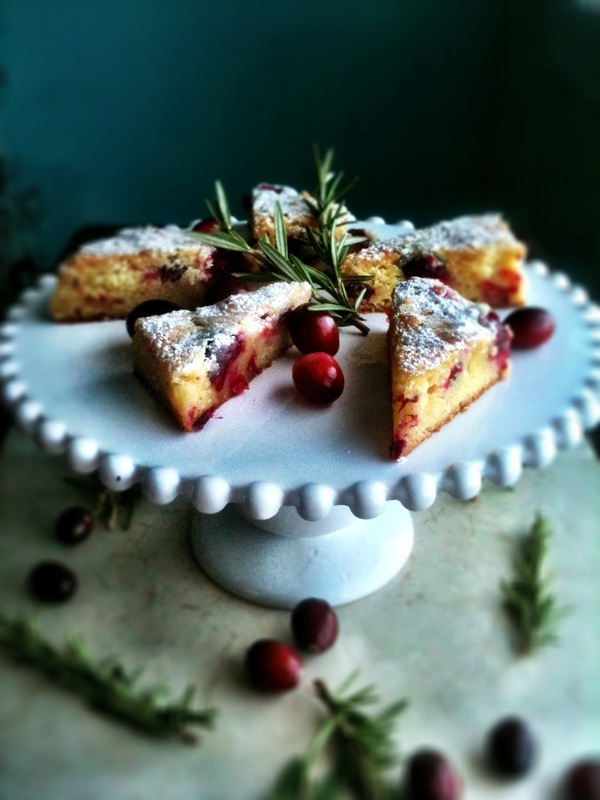 I love that you used fresh cranberries, and rosemary is a favorite of mine too! I know you work hard this time of year, and hope you get to really relax and enjoy some quiet time with the family and handsome man. Stumbled across your blog today and I'm so glad I did! Everything looks and sounds amazing!! !